I first run into this guy back in 2008 when he had a cool alternative/shoegaze/post rock band Joensuu 1685 with his brothers. They even gave me their album to review which was nice. Too bad that they never released another one, but they were at their best in their energetic live shows I would say. His two brothers (Markus and Risto) went on to form another band Siinai which was even better with more kraut/psychedelic rock influences, just check out their album Supermarket or collaborations with Moonface. 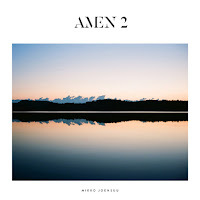 Mikko took another path and his first solo album Amen 1 was a soothing, spiritual experience of Americana folk-country. I got to say this is not exactly my cup of tea (I can't stand musicians trying to be Leonard Cohen, for example) so I sort of skipped it, although I did like the Spiritualized styled pseudo-gospel vibes that were already there. On Amen 2 Mikko sort of follows the same path but takes things a bit further with fuller, more complex arrangements and instrumentation. You can hear some noisy guitar, lots of strings and choirs, synthesizers and even some danceable beats on this one. The overall vibe is still very spiritual and relaxing, but there is much more variation making this album a lot more interesting in my mind. Fans of Spiritualized or even Spacemen 3 might like this album I would say since it has enough hypnotic shoegaze elements along with the gospel stuff. I like Mikko's soulful voice and subtle melodies and the production is top-notch so I'd say this is a very nice album as a whole. If what I've heard is true the third part of the trilogy will also include some space rock stuff so I'm really looking forward to that... Please note that Mikko Joensuu is playing a show with a full band tonight at Bar Loose in Helsinki and I'm sure it will spectacular... See you there!